There is no meaning in dwelling on our own suffering. It just leads to greater pain. Transforming pain and suffering into something meaningful is essential in these times as we are constantly surrounded by difficulties. There is no way of avoiding unpleasant, difficult situations but we can change our attitude towards them so they are no longer problems for us. Instead of becoming unhappy and discouraged we can use them to develop powerful, happy minds. In this day course Kelsang Luma will explain various methods to help us transform our everyday appearances of suffering into something immensely meaningful. Cost includes morning and afternoon tea. Please bring your own lunch or there are cafes nearby. Venue: (Please do not park on Upper Crichton Terrace as it’s a Private Lane). 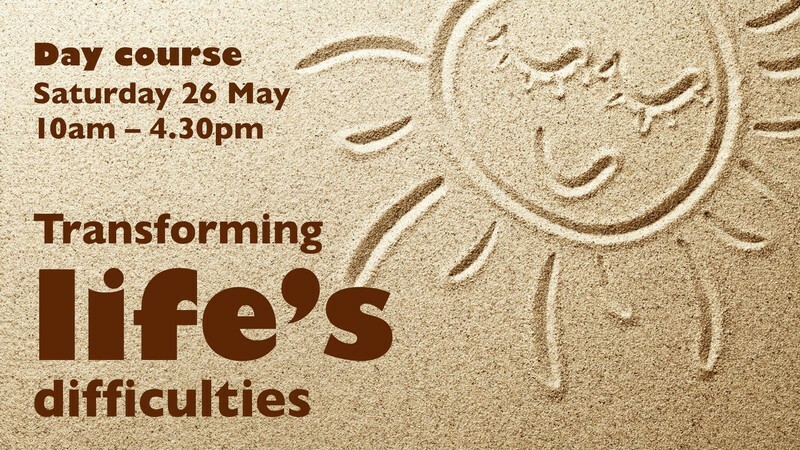 Booking is essential, so please book online now http://meditateinchristchurch.org/wp/transforming-lifes-difficulties-day-course, or contact the Centre to book your place. These classes are based on Buddha’s teachings on the mind, but you do not need to be a Buddhist to attend or to benefit from them. There is no physical exercise involved and you can choose to sit either in a chair or on a cushion. These classes are suitable for all levels of experience.